Spinning today in the 'rock room' is a revolutionary and influential single released by one of rock and roll's formative statesman of the genre. 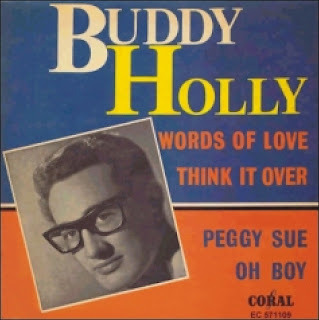 In April of 1957 Buddy Holly and the Crickets entered the studio and recorded the track 'Words of Love' as a follow up single to the song that put Holly on the map, 'That'll Be the Day'. Typical of a forward thinking and progressive musician such as Holly, he spent much of his time following his hit in early 1957 composing and developing new ways of musical expression. Biography's of Buddy Holly document that he was heavily influenced by the 1956 single released by Ian and Sylvia, 'Love Is Strange'. The sleek sensual arrangement and distinctive guitar breakdown that takes place between verses of the aforementioned single are some of the respective elements co-opted and used to great but differing effect on Holly's own track. Both songs equally emanate a innocent eroticism, respective of the late 1950's era as well as expressing the giddiness of new experimentation and discovery in both music and sexual relationships. Holly looked to create a mood as well as develop a addictive rhythm in 'Words of Love'. He was successful in doing both as the song sketches out a private moment between two lovers, while the music slinks around in the background like a audible LP spinning in the adjoining room. 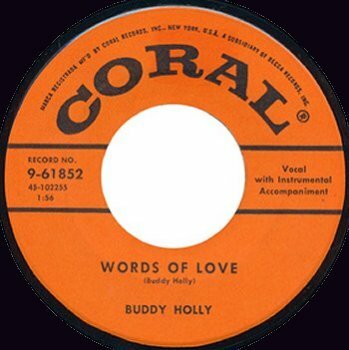 'Words of Love' was released as a single on the Coral label in June 1957 b/w 'Mailman Bring Me No More Blues'. The song did not chart, but its impact could not be denied as it would influence and inspire a host of songwriters; including but not limited to, John Lennon and Paul McCartney who would release heir own stellar cover version of 'Words of Love' on the Beatles 1964 LP Beatles For Sale. The Beatles would expand on Holly's vocal approach with three part harmonies paying tribute to their respective idol and influence. 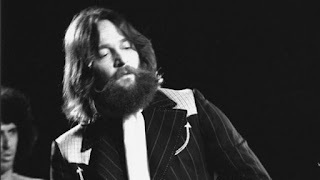 A hallmark of the Holly recording sessions and of the finished vinyl product was Holly's beautifully crafted double tracked vocal lines, conversational, comforting and capable of seduction. Close to the conclusion of the recording of the song in the studio, Holly decided he wanted to harmonize with himself, as opposed to using the usual practice of backing singers. Holly added the overdub and the result made the song cinematic in addition to aural. By overdubbing an additional vocal line he also slightly lowered the fidelity of the existing track, lending a soft muted fuzziness to the tape. Holly's vocals are an inch from your ear, while the music lends soundtrack anticipation just a bit in the background. Holly's sung verses roll off of the tongue sticky sweet while Jerry Allison's drums roll a tribal dance rhythm that keeps the elongated melody in pace with the groove. Holly's airy moans at the end of each vocal line and his additional 'uh, ah's that additionally punctuate the end words also turn up the intimacy factor between Holly and the female subject. Instrumentally the song boils with an acoustic guitar, drums, and bass stew in which Holly's guitar states the ticklish melody. Like the Ian and Sylvia song 'Love Is Strange' the song contains a strange pulse in which the languid counter vocals drape themselves across. Holly's Fender Stratocaster is the real focus though- as it slices through the arrangement with a shimmering watery twang that recites the central lick in a solo spotlight tucked between each respective verse. Holly's slippery neck licks and dynamic picking draws focus to his prowess as a guitarist. As with his vocal approach, Holly's guitar playing was also dissected and often copied in a loving fashion by future rockers. His tone on 'Words of Love' I believe can be attributed to his first 1954-55 Strat and a Fender Pro, 15 watt amp, but I cannot confirm this. Regardless, the guitar is a dangerous knife edge that slices and dices with every plectrum strike. The guitar melody is a hybrid of honky- tonk and island music, that disappears between the layered vocal waves before again appearing when the music takes pause. It's hide and seek dynamic lends a playfulness to sexual seriousness of the lyric and vocals. 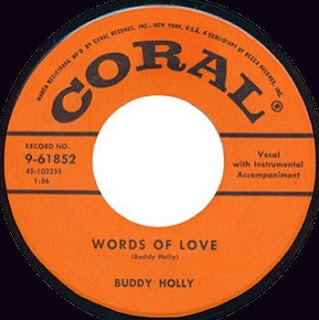 'Words of Love' is a special song that is representative of the late 1950's rock revolution with figures like Buddy, Gene and Elvis leading the way. 'Words of Love' documents Holly as he employs new approaches vocally and instrumentally to his compositions, in addition to honing his blossoming guitar talents. 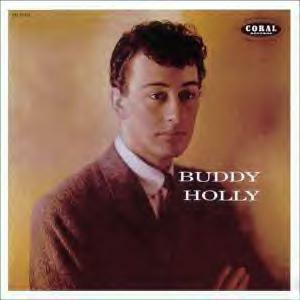 An inspirational figure like Buddy Holly sometimes gets lost in his own imposing historical shadow. Its a good thing to revisit the music and remember why and how his talent became to be so recognized and remembered. Like cracking open an old book, playing the music keeps the songs breathing and hopefully in some small way passes along the melodies on for future enjoyment.